By a strange twist of fate, I ended up seeing Brave twice - once in 3D and once in 2D. I'd like to say right out of the gate that if you are so inclined to see this film, DO NOT see it in 3D. It doesn't enhance the film dramatically, it takes the incredibly vivid colors and makes them drab, and muddies up the the numerous night scenes making the characters almost completely indiscernible from one another. Save your cash - it's not worth it! Also, be sure to stay til the very end of the credits for a mini-bonus sequence. Now, for the rest of the review. 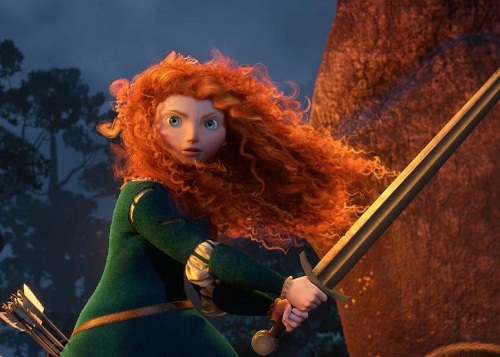 The spunky Scottish princess (voiced brilliantly by Kelly Macdonald) does a lot of running around on her amazingly animated horse, Angus, tossing her tornado of red curls around, and stamping her foot while echoing her mother's wise words that "Legends are lessons. They ring with truth." Clearly there is some legend to be told and we are supposed to learn something from it. But it's not really clear what that lesson is, other than don't make any deals with wily witches in forests before you've read the fine print. But we all know THAT. This doesn't make for a BAD film, but let's face it - we've all gotten semi-biased when it comes to Pixar. After all they've put out hit after hit. Toy Story, Ratatouille, and my personal favorite, The Incredibles. (Apparently I'm not alone in this one - a recent Entertainment Weekly poll showed that 21 percent of their readers consider The Incredibles their favorite despite it being eight years old.) And why were they so good? Because they had amazing stories to be told to go along with the jaw-droppingly beautiful and innovative animation. I enjoyed Brave and there are certain parts of it that I'm actually quite fond of - even the parts that BEARLY made sense (you'll forgive the pun if you've already seen the film.) But as Pixar aficionados, we've gotten used to being served the best of the best - and this is definitely not. It's an absolute visual stunner, but plotwise it fails to be as inventive. But let's put all of this comparison stuff aside for a moment and look at the film in its own right. I really enjoyed the dry, cutting humor combined with slapstick, provided via Merida's father and the other bumbling clansmen chiefs, their ineffectual sons (all vying for the hand of Merida at their father's forced nudges) and Merida's three younger brothers - a hive of mischief and well-coordinated and executed crimson-curled mayhem. Her brothers, which so easily could have been three-minute gags sporadically pastiched on the storyboard for comedy relief, end up serving as important plot devices throughout the film as a whole. There's also very Hayao Miyazaki-like overtones to the Will O' The Wisps that beckon Merida toward her "fate." I also found the relationship dynamics between Merida and her long-suffering mother, Queen Elinor (voiced by the ever-versatile Emma Thompson), to be quite genuine (having had my own share of clashes with my own mother as a young teen not so unlike Merida, minus the crazy mop of red hair) and, at times, incredibly heartfelt. WARNING: FROM HERE ON OUT, THERE BE PLOT SPOILERS, MATEYS. I actually didn't mind the Ursa Major plotline so much. It's a plot device of a human trying to work out their flaws by walking in the paws of another animal's skin, and though done before, can be an effective one of executed creatively. Merida's mum turning into a bear was not a problem for me. It was the fact that Pixar seemed to get lazy with what to do once her mum became a bear. Okay, we're going to learn to fish together. Quality time. Her mum learns that sometimes it is important to fight and know how to use weapons. Yay growing experiences! of tradition and dynasties flushed down the proverbial toilet if Merida prefers to stay single. And what of the witch? Does she ever come back? Where did she ever come from? She's fun and spunky and someone I would've liked to have gotten to know better if the plotline hadn't been so hellbent on reaching it's desired conclusion with the same pacing as Merida charging through the woods on Angus. So who ends up being Brave in the end? Our fiery-haired heroine of the hour, Merida? Her strong-willed mother, Queen Elinor? Or maybe us in the audience, who put our faith into a film that was a joy to view with beautiful music but ended up being little more than a summer popcorn movie and a way to beat the heat for an hour and change. And that's okay too - but Pixar, next time around, don't put all your creative eggs into one basket in your beginning short, the absolutely flawless and breath-taking La Luna -I won't say any more about it except that it has the wide-eyed wonder and brushed gold magic that makes Pixar creations truly stunning - and leave nothing left for the main feature. I'll likely see this when it comes out on DVD. I was pretty fired up from the previews, but I found that everything I'm hearing about it toned that eagerness down.